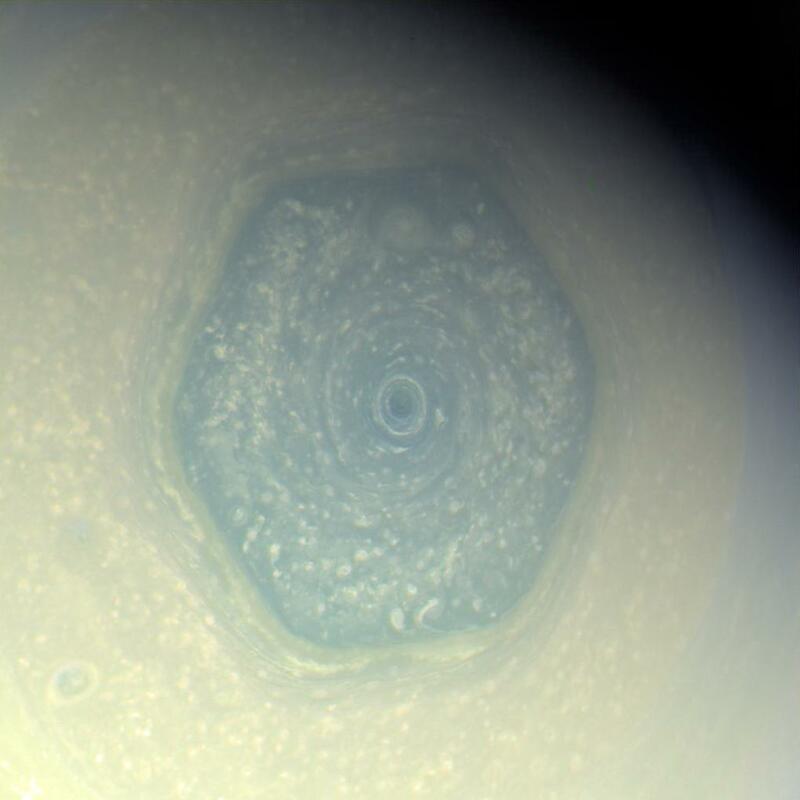 It’s like nothing we’ve seen on any other planet in the entire Universe, and now the mysterious structure on Saturn’s north pole just got even weirder. In just four years, Saturn’s hexagon has changed its colour from blue to gold. So far, our best guess as to why this change occurred is that this is what it looks like when Saturn's north pole gears up for next year's summer solstice. Discovered almost 30 years ago, Saturn’s hexagon is a six-sided structure that spans roughly 32,000 km (20,000 miles) in diameter, and extends about 100 km (60 miles) down into the planet’s dense atmosphere. As observed by NASA’s Voyager and Cassini spacecraft, each point of the hexagon appears to rotate at its centre at nearly the same rate that Saturn rotates on its axis. Along the rim of the hexagon, a jet stream of air is blasting eastward at speeds of 321 km/h (200 mph). Based on its size and movements, scientists have concluded that it’s a vast cloud pattern generated by a gigantic, perpetual hurricane spinning at the centre of the planet's north pole. Scientists estimate that this storm has been raging for decades - maybe even centuries. While we’re pretty confident that we know what Saturn’s hexagon is, the big mystery is how it got there in the first place. Once you have a giant whirlpool of air, it’s relatively easy to keep it spinning - but the force you need to get it wound up in the first place is a whole lot more difficult to explain. "Scientists have bandied about a number of explanations for the hexagon’s origin," says Charles Q. Choi from Space.com. "For instance, water swirling inside a bucket can generate whirlpools possessing holes with geometric shapes. However, there is of course no giant bucket on Saturn holding this gargantuan hexagon." The best hypothesis we have right now is that this is what it looks like when Saturn changes seasons. With a year that lasts 29 Earth years, Saturn changes seasons only once every seven years, and the increased sunlight over the past three years could explain the golden haze. "The colour change is thought to be an effect of Saturn's seasons. In particular, the change from a bluish colour to a more golden hue may be due to the increased production of photochemical hazes in the atmosphere as the north pole approaches summer solstice in May 2017." So how does this work? It’s thought that the hexagon acts sort of like a barrier, preventing haze - or aerosol - particles produced on the outside from getting in. This is evidenced by the fact that when scientists analysed the hexagon in false colour (as seen in the video below), they noticed differences in the types of particles that were being suspended in the atmosphere - both inside and outside the hexagon. "Inside the hexagon, there are fewer large haze particles and a concentration of small haze particles, while outside the hexagon, the opposite is true," Kunio Sayanagi, a Cassini imaging team associate at Hampton University, explained back in 2013. "The hexagonal jet stream is acting like a barrier, which results in something like Earth's Antarctic ozone hole." But since Saturn reached its equinox in August 2009 - the point where the Sun is directly over Saturn's equator - it's been gradually exposed to more and more sunlight. This means for the past three years, aerosols have been produced inside of the hexagon and around the north pole, making the polar atmosphere appear hazy and golden when photographed last month. Without more evidence though, this is just an educated guess, and scientists at NASA now have an investigation underway to figure out what's actually going on here. Cassini is continuing its orbits around Saturn, and its moons, Titan, Mimas, Daphnis, Methone, and Pandora, in the coming months, so get ready to see more strange images of their seasonal shifts.